Begin by visiting detroithomedesignawards.com and registering an account for your organization. Once you’re registered, and after you’ve signed in, click the “New Entry” link and fill out the form with your project details and attach your images. Remember to save your entry. You may revisit and submit as many entries as you wish until October 1, 2018. Once you’ve entered all of your projects, use the “Submit and Pay” link to check out and finalize your submissions. Each entry must be accompanied by at least one, but no more than eight, high-resolution image(s). Images submitted must be about 8 x 10 inches, at 300dpi minimum (any image that does not meet this requirement will not be accepted). The acceptable format is JPG, with a size limitation of 50MB per image. Please see our Photography Terms section. You may enter as many projects as you wish. Please upload your appropriately named images via the online submission form. To ensure anonymity, photos should be named by category and NOT the name of designer and/or homeowner submitting the project. Example of correct image name: traditionalgreatroom1.jpg, traditionalgreatroom2.jpg. If you are listing your photographer’s name and that photographer shot photos that you are entering in more than one category, please list your photographer’s name/company the same way throughout. Please provide a typed overview (100 - 250 words) detailing significant aspects of the project. The statement should discuss design challenges, location (city name), design solutions, and other pertinent aspects, but must not mention firm name, nor individuals involved. Entrants must include the year the project was completed. Design projects more than five years old will not be accepted. Projects should be submitted via the entry-submission form at detroithomedesignawards.com. Rising Star nominees must have fewer than 10 consecutive years experience in their field, and must have completed at least one significant project. Nominations must be submitted by someone other than the nominee. Nominees will be contacted for complete portfolio, résumé and professional photo. No fee is required for nomination. “Readers’ Choice Best Overall Home” is an award given to the project that receives the most votes from Detroit Home readers at detroithomemag.com. Projects submitted in the Best Overall Home category are automatically available online for readers to cast their votes and are eligible to win the Readers’ Choice Best Overall Home award. An independent panel is selected from outside Michigan. Judges are drawn from national media (print and television), respected academic institutions, and private practice, and include nationally recognized names from design and architecture. Their expertise reflects a broad spectrum of related professions, including architecture, interior design, and landscape architecture. All judges’ decisions are final. Entries that have won in or were submitted to competitions other than the DHDA are allowed. Entries that have been submitted previously (in other years) in the DHDA competition are allowed. Entries that have won in the DHDA competition (in other years) are not allowed to be submitted in the same category in which they already won. All entries must be submitted, and paid for in full, via web form, by October 1, 2018. Entry fees are payable via our online entry form, which accepts PayPal, Visa®, MasterCard® or American Express®. One half the entry fee will be rebated as a voucher toward the purchase of an advertisement in the April/May 2019 special Design Awards issue of Detroit Home magazine. For advertising opportunities, contact Jason Hosko at 248-268-8026. Entrants must secure and submit royalty/reuse-free photos from their photographer before submitting images (to run in Detroit Home / detroithomemag.com at no additional charge). All photography submitted may be published free of charge by Hour Media for up to one year from submission date. It is the entrant’s responsibility to inform the photographer of these terms. Important note: If you list a co-entrant on an entry, the co-entrant’s name will appear as a co-winner with your company name in the magazine and on the award plaque if your submission is selected as a winner. There is a separate opportunity on the submission form to list others who contributed to the project; this area is optional and those you list here will NOT receive an award plaque if your entry is selected as a winner. Their names, however, may be featured in the DHDA magazine editorial. Failure to comply fully with contest rules may result in disqualification. Entry fee is non-refundable and will not be returned (even if entry is determined to be ineligible or disqualified). Hour Media is not liable for lost, stolen, ineligible, misdirected, damaged, mutilated, or postage-due entries. Winning submissions become the property of Detroit Home magazine. 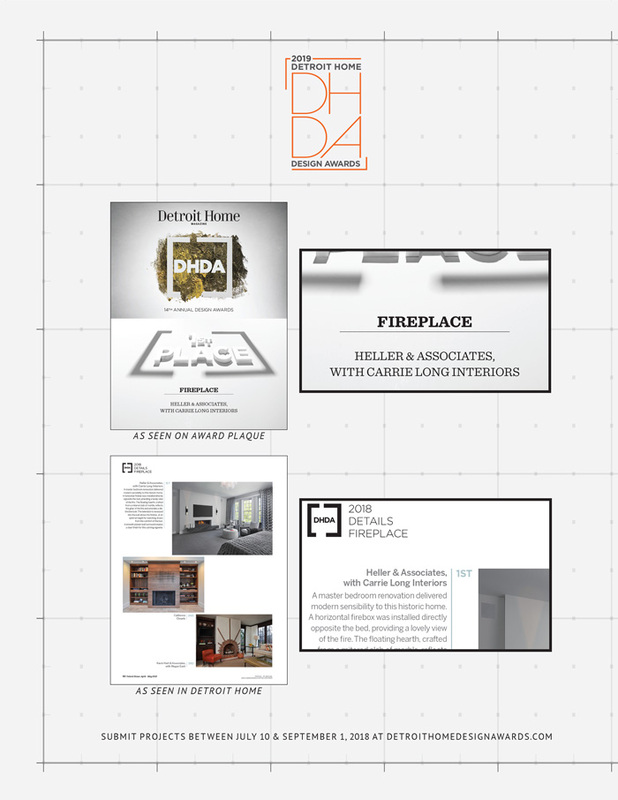 Detroit Home retains legal/publishing rights through one year after publishing of the April/May 2019 Design Awards issue.